In our last tutorial, we covered how to properly align your fabric for laying out your pattern pieces on the grain. Let's return to our three magical steps to better pattern cutting! Now that our fabric is aligned, we can mark and cut our pieces. There are two schools of thought when it comes to cutting fabric from a pattern. Pin pattern to fabric, cut around pattern pieces, mark pieces. Place weights on or pin pattern, trace around pattern pieces and mark, remove pattern and cut tracing. I tend to be a fan of the 2nd method because all the marking happens at once and you don't accidentally cut your pattern pieces. So this is the method I'll cover here. Chalk is the good old standby. Cons: Sometimes an iron can set chalk marks (do a test before using), marks can rub off easily before you need them, draws a thick line, hard to use on slippery or stretchy fabrics, can get 'dull' after a lot of marking (to fix, take a butter knife and sharpen up the edge), often breaks. When to use: Great for projects using quilting cotton or other medium weight fabrics. This is my personal favorite. All the benefits of chalk, but in a roller that creates a thin, clear line. Pros: Draws a fine line, rolls so it does not get resistance from fabric making it great for tricky fabrics, makes a pleasant 'clicky' sound, doesn't break like regular chalk. Cons: Like regular chalk can rub off easily, periodically needs to be re-filled, can be hard to find. 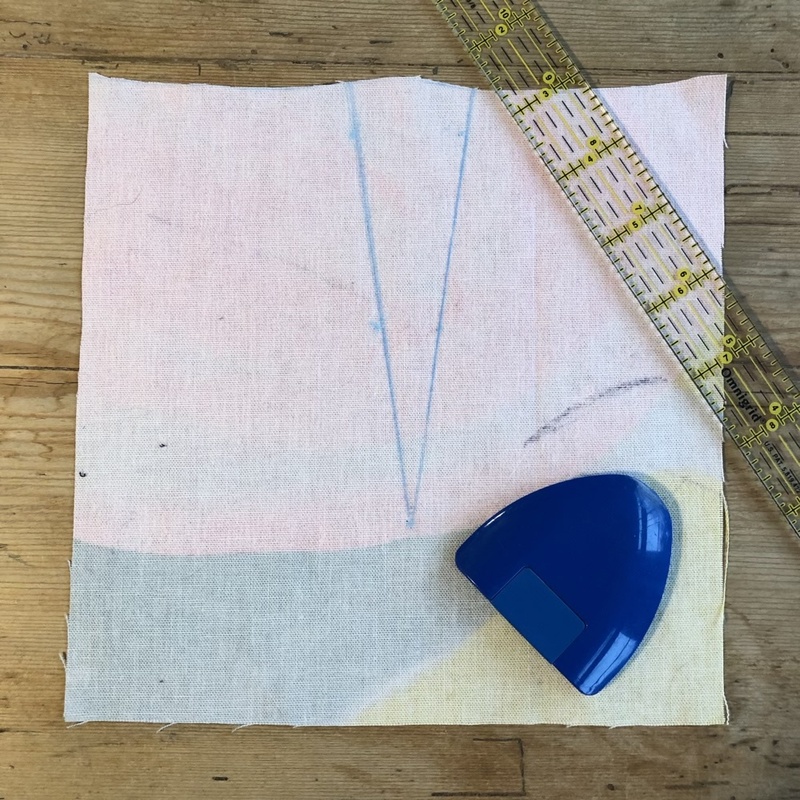 When to use: When marking tricky fabrics like jersey or silk, for markings you intend to sew right away. Be sure to buy the kind for fabric, not paper. Clover and Dritz make them. Goes on blue or purple and erases with water. Pros: Much longer lasting than chalk, felt tip pen makes marking easier, often easier to see than chalk. Cons: Sometimes marks don't come out all the way (always test first on a scrap), draws a thicker line than chalk makers. When to use: When you need a clear, long lasting mark. A pen with exactly that, ink that disappears after a period of time. Pros: Clear markings, easier to use, no need to remove as they will fade on their own. Cons: Fades away - not ideal for marking a project that won't get finished immediately, may not fade completely (always test first on a scrap). 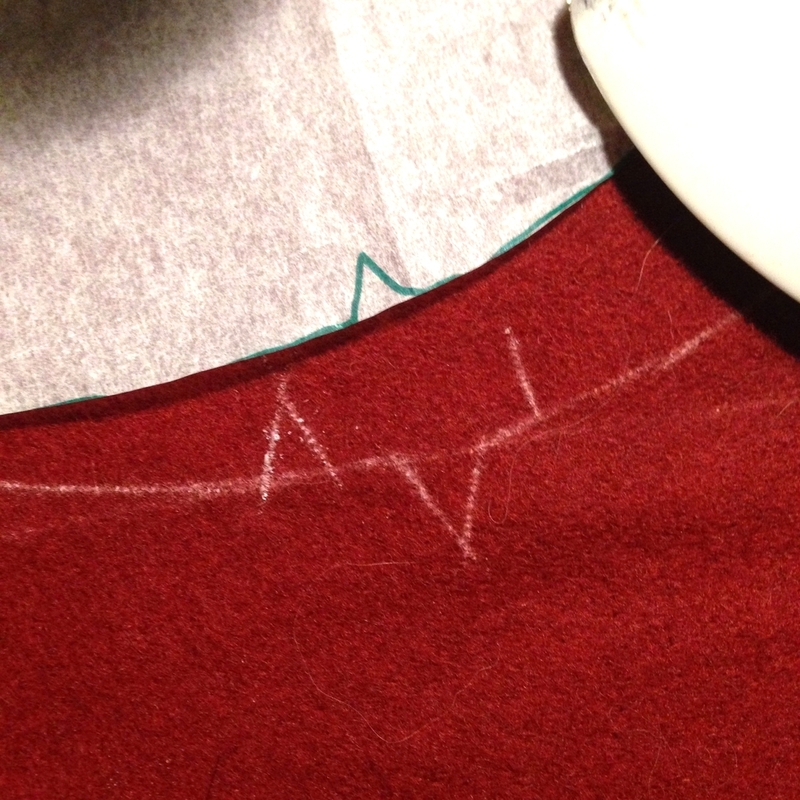 When to use: For quick marks as you sew, when chalk is not ideal. Pros: great for marking on fabric where other methods aren't ideal or are impossible (fine fabrics, sequined or embroidered fabric, lace), leaves little to no residue on fabric, not affected by the iron. Cons: Time consuming! On very fine fabrics thread can leave holes, tacks sometimes come out or can be pulled out accidentally, thread in sewn areas can get stuck in stitching and need to be picked out. When to use: Specialty fabrics, marking things like grainline or pocket placement in the middle of garment where other methods leave marks. Try these tools and see which you like best. 2. Secure your pattern, either with weights, random objects around your studio, or pins. I prefer weights as they do not ripple the pattern paper like pins do. Here I'm using simple pattern weights made out of stacks of pennies and foreign coins wrapped in muslin. Large washers and paperweights also work well. 3. Using your fabric fabric marking tool (see below), trace around your pieces. Here I've marked the notch in 3 ways, typically you only mark where the notch is. L-R: Inward facing (like the pattern), outward facing, or just a snip. When snipping, be careful not to cut too close to the seamline. 5. Mark darts and other details on the inside of the garment by placing pins through the pattern at key points, then pulling away pattern paper to mark next to the pin. Remember to mark where the pin goes through on the opposite side of the fabric. Lift up your paper pattern and rub chalk at the point where the pin enters the fabric. The pin should help you make a nice crisp mark. Flip the piece over and mark where the same pin exits the fabric. Now you are ready to cut your fabric! You can use either scissors or a rotary cutter to cut out your pieces. Both have their pros and cons. The most common scissors used for cutting fabric are dressmakers shears, which have a bent handle. This makes it easier to keep the fabric laying flat while you cut. Use your scissors only for fabric to keep them nice and sharp. Pros: Usually easier to control your cuts, better for cutting curves or small details, doesn't require a cutting mat. Cons: Cuts are not always even, especially for new sewists, less control when cutting slippery or knit fabrics, can hurt your hand when cutting large quantities of fabric. When to use: For general cutting, especially pattern pieces with curves. Rotary cutters are like pizza cutters for fabric, with a rolling blade. Pros: Great for cutting long straight lines, helpfuls when cutting sliper fabrics as the fabric stays put while cutting, can be more precise than scissors. Cons: Must use a cutting mat underneath so as not to damage your table, straight cuts require the use of a ruler, not good for cutting curves, inward corners, or other details, blades dull more quickly. When to use: Rotary cutters are great for quilting, cutting bias strips, or anything with many long, straight cuts. Though the 'start up' cost (for cutter, mat, and rulers) is more, it is a good investment if you do that kind of work. You can use both of these tools in combination, using each one for a specific part of your cutting. Rather than cutting outside the tracing line, cut away the tracing line. Between the tracing line sitting on the outside of the pattern, then cutting outside of the tracing line, your pattern could grow by a 1/4" all around! Pattern piece cut out with all notches, darts, and other markings drawn in. For mirror image pieces, like the right & left side of a shirt, I like to draw a faint letter L and R on each piece in chalk on the fabric's wrong side. This can help avoid unintentional sewing mishaps. By taking care to align and cut your pieces accurately, you'll avoid headaches and mistakes later on in your sewing. Have questions about cutting & marking? Leave them in the comments below! There's a woodworking adage that goes, 'measure twice, cut once'. The same is definitely true of sewing. Cutting is arguably the most difficult and crucial of steps in any sewing project. While seams can be ripped and re-sewn many times, cutting is forever. Even wonder why after sewing something the final garment doesn't hang or sit quite right or a sleeve hem or edge becomes uneven? Or perhaps you notice that the print on your fabric is going in different directions on each piece? Aligning your fabric properly for cutting will save you time and frustration and help you create a better looking and fitting garment. In order to better understand why alignment is so important, let's talk a bit about fabric grain. Woven fabric refers to fabric that is woven on a loom. (When we talk about grain, we're talking primarily about woven fabric. Knit fabric has a different set of parameters. We'll cover that in a future tutorial!) Many fabrics you encounter in stores are woven. In weaving, fabric is created by setting up long vertical threads (called the Warp) and then weaving horizontally through these threads (called the Weft). When we talk about fabric grain, we are referring to the lengthwise threads (the warp) of the fabric. The lengthwise grain is stable, with a little bit of stretch on the cross grain (the weft) and a bit more stretch on the bias (diagonal grain). Most patterns have you fold your fabric in half before you lay out your pieces. Now imagine you cut out your pieces through two layers of fabric. The top layer seems properly aligned, but perhaps the bottom layer is slightly askew. This will result in uneven pattern pieces which can throw off the fit or distort your fabric print (especially for stripes or plaids!) Even worse, sometimes pattern cut on fabric where the grain is distorted will return to the natural grain alignment after washing, resulting in wonky looking garment. In gingham (a 'yarn dyed' fabric, meaning that the stripes are made from weaving different color yarns, not printed) it is easy to see if the grain is in alignment. The same fabric, but 'off grain', meaning that the grain has skewed or shifted, throwing the pattern, and the fabric, out of alignment. Some fabric that your bring home from the store may have a grain that is slightly out of wack - often a result of the process used to wind the fabric onto the bolt. Additionally, sometimes the fabric is cut unevenly at the store. This can cause the nice new fabric to be out of alignment from the get go. On the plaid above, also 'yarn dyed', it is easy to see when the fabric is cut unevenly. It can be trickier to tell if the edge is evenly cut on solid and printed fabrics. On the left, you can see threads of the fabric fraying. On the right, since the fabric is cut along the grain, the fabric 'frays' evenly without any stray threads, though you could pull away one single thread of the weft. If you notice there are a lot of loose threads coming off of your cut edge, this could be an indicator of an uneven cut. Fabric cut on the grain will have minimum fraying, since the weft threads run all the way across. Pre-wash your fabric. This is a great rule of thumb with every project. It takes care of potential shrinkage, dye bleeding, or fading and will often 'reset' a weird grain. Wash and dry your fabric however you plan to wash and dry the final item. 1. Snip your fabric at the selvedge about 2" from the cut line. 2. Holding both sides firmly, rip your fabric in a quick, consistent motion. Each time you rip, hold on near each side of the end of the last ripped section. Rip in short, quick tugs. It should rip cleanly along one thread of the fabric. Once you've ripped all the way through, you may have some long, loose threads. These are the weft threads on either side, and can be pulled away for a clean edge. 1. Snip into your selvedge. Pull apart the fabric to reveal a few little loose threads. 2. Holding onto one thread firmly, pull it and scrunch the fabric along the thread. This should create a ripple along the cross grain of your fabric. With printed fabrics, you can often see a line created by this pull. 3. Cut along this ripple across the fabric. With tightly woven fabric, or if the thread you are pulling breaks, you may have to repeat this a few times, scrunching, cutting, and finding the loose thread. 4. You may result with a slightly uneven edge, but the overall cut will be true to your grainline. Pull back a few threads and the grain will be revealed! Pull away the loose threads to reveal the fabric grain! Trim if necessary. Or, if your fabric is a yarn dyed stripe or plaid, simply cut along the pattern. Cutting along the edge of the green stripe of the fabric to find the grain. Finally, fold your fabric in half, matching up this new on-the-grain cut edge as well as the selvedge. Using a gridded cutting mat or table is a great way to check if your fabric is aligned. Once folded, it should match up with the lines on the table, just like in the pink gingham swatch shown in the beginning. If your fabric folds up perfectly into an even little rectangle, you're in luck! You should have nice smooth fabric at the fold without any wrinkles. Make a note of which direction the wrinkles are 'pointing'. Place a safety pin in the corner that the wrinkles point to. Unfold your fabric and grab opposite corners without the safety pin, and give them a nice hard tug. You may need to do this across the bias (diagonal) grain in a few places if you have a big fabric piece. 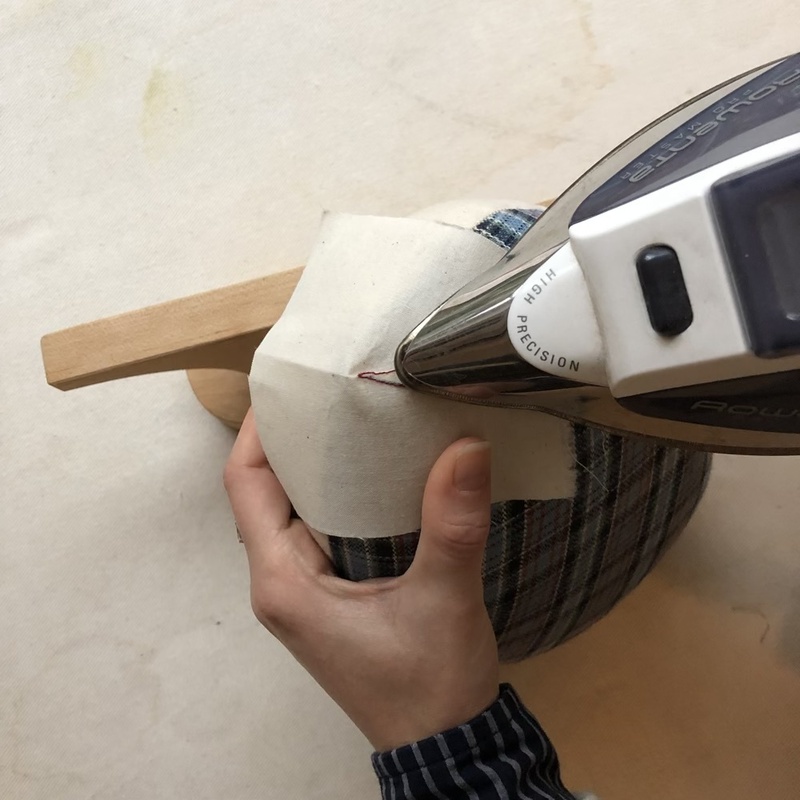 Realign your fabric to check if the grain has been fixed. If not, try folding in half again and steaming with your iron above the fabric. Smooth the fabric into the desired position and let dry. Once aligned, your fabric should look like the folded fabric in the first pictue. If your fabric looks like this, move on to the next section! 1. Identify the grain lines on your pattern. The 'fold line' represents the grain on pieces cut on the fold. This is because, ideally, your fabric fold should be right on the grain. 2. Position your pieces as indicated on the pattern. 3. Going piece by piece, measure from one end of your grainline to either the selvedge or the fold of the fabric. 4. Measure from the other end of the grainline to the selvedge/fold. If it is not equal to the 1st measurement, adjust it so it is. 1. Take a square, clear ruler (like those used for quilting) and align one side with the grain. 2. Line the opposite side, or a measurement along the ruler, with either the selvedge or fold line. 3. Secure your pieces with pins or pattern weights. Now you are ready to mark and cut! I'm teaching a pants making class at JP Knit & Stitch in April and we're using the Colette Juniper Pants pattern. I have to say, I was a bit skeptical. I typically don't wear pants as I have a figure that makes it hard to fit them and impossible to find RTW that works. Many of my students have expressed a desire to be able to make and fit pants, so when the Juniper pattern came into the store I thought it would be a great opportunity try it out as a possible pattern option. I personally have been looking for a higher rise, wide leg pant that didn't scream hippie mom or 1940's sailor (thought there's nothing wrong with those looks) and these fit the bill. I have to say, I'm quite pleased with both the fit and the rise so far. I think the absence of a fitted thigh is a huge advantage in my case (In a more fitted pant, I may blend sizes with a high hip 2 sizes bigger than my waist and a thigh/low hip one size bigger than that). I also really like the pocket construction, and I used the opportunity to try out a slash pocket finish that I have done on a few pieces for clients. I got the idea from a pair of high end RTW shorts and I'm embarrassed to say I didn't think of it before. I love any opportunity in a pattern to do a self seam finish: I do french (both real and faux) and flat fell seams whenever possible. I especially like this when to do so is sort of counter intuitive. I wanted an extra strong pocket that was clean without any unravelies to stick out in the pants since they arent lined. I also wanted something lightweight, so binding wasn't in the cards. 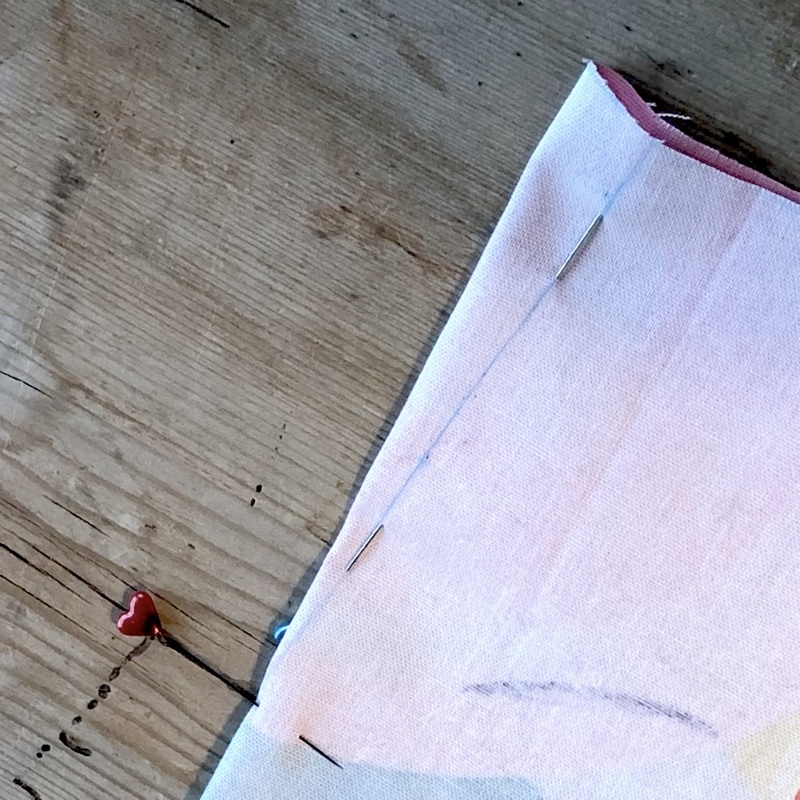 So here's how to do a french seam slash pocket bag on the Colette Juniper pants. I realize that while I took the time to make a nicely finished pocket bag, I neglected to do anything at all to the seam joining the pants fashion fabric to the upper and lower pocket bag. In hindsight, I would have probably finished both seams with a flat felled seam sewn on the pocket bag side. I think I decided to do this finish after sewing those seams and was primarily lazy. I avoid undoing whenever possible...it's an exercise in acceptance. 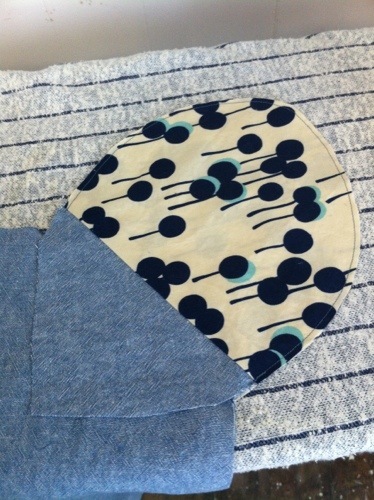 Step 1: With WS together, matching up notches, sew around the pocket bag at a 1/8" SA. Start and stop stitching at the pocket bag seam. 2. Turn the pocket inside out, push out the pocket along the seam using your fingers or a point turner. Your stitching will extend almost all the way to the end of your pocket bag seam. The remaining, unstitched seam allowance should be folded out. 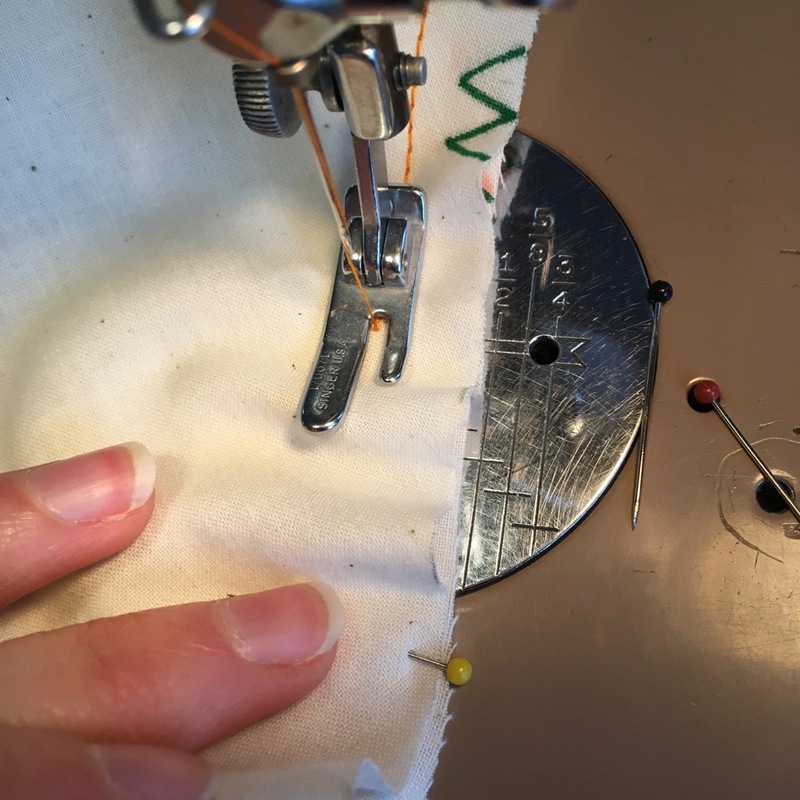 When sewing the pocket bag a second time on the actual seamline, you'll want to start and end where the pocket bag attaches to the main pants front. Mark this horizontal seamline with chalk or a pin if you need to. 3. Give the pocket bag a nice press. 4. Stitch around the pocket bag as indicated in the pattern instructions. Start with a 5/8" seam allowance at the beginning where your SA is unstitched. When you get to the part where 1/8" is stitched in, your SA should easily line up with the 1/2" mark. Continue stitching around the pocket bag at 1/2" until you come to the last bit of unstitched SA. You should easily be able to keep stitching as the fabric edge lines up with the 5/8" mark. Stitch until the pocket bag seam on the pants front, as indicated on the pattern. 5. Fold the pocket into its final position and give it a good press. 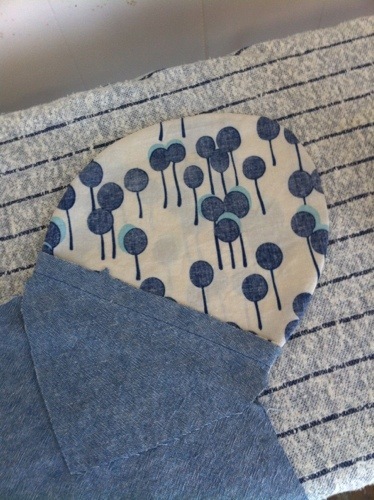 You now have a nicely finished french seam pocket. A french seam is an idea finish for a pocket bag since it is one of the few applications you can use a french seam on a curve. Why? Because it is never turned right side out, and therefore the curves do not need to flex the other direction or lay flat, something that would be hindered by a french seam typically. One of the best parts? With two seams, these pockets will be extra strong! Can't wait to finish these babies up! As usual, Sarai's instructions, especially for complicated things (like fly insertion), are excellent. There was only one thing I would have done differently. The pattern calls for a 7" zipper. I prefer metal zippers in my clothing as they last longer, wont melt under an iron, and have a bit of a vintage feel that I love. In this pattern, your pants zipper is trimmed at the waistline. Though removing metal zipper teeth resulted in some interesting visuals, I think I would have preferred to use a 5"(4"?) zipper instead.